To take advantage of our "Monthly WOW!" come into the shop and tell us that you saw it on our website! 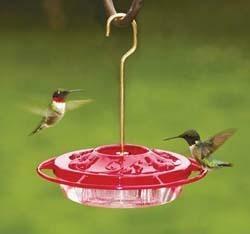 Welcome hummingbirds to your backyard by offering multiple Wild Birds Unlimited Hummingbird Feeders. They are designed to appeal to hummingbirds and allow them to hover or perch while feeding. Our Hummingbird Feeders do not leak, and the built-in ant moats deter crawling insects. 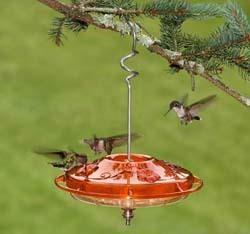 These feeders are easy to clean and come with a lifetime guarantee. 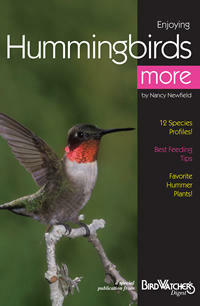 Buy Any WBU Hummingbird Feeder; get 'Enjoying Hummingbirds More' book for FREE! *Valid only at WBU McKinney. One discount per purchase. Offer not valid on previous purchases or sale items. Offer expires 3/31/19. WBU Hummingbird Feeder: These specially designed feeders have built-in ant moats to keep bugs out and feeding ports that prevent rain water from diluting the nectar solution. They’re easy to hang or pole-mount and easy to clean (top shelf dishwasher safe). They’re also backed with a lifetime guarantee. 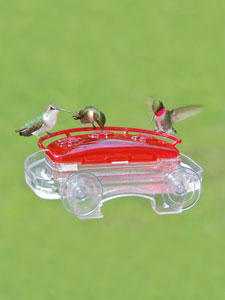 Window Hummingbird Feeder: only a window pane stands between you and "the jewels of nature" — hummingbirds. This feeder is easily mounted to any window with two suction cups, and its clear bottom allows you to see hummingbirds quickly lap up the nectar solution. The Decorative Window Hummingbird Feeder features three feeding stations and a moat that, when filled with water, will keep ants and other crawling insects out of the feeder. It's also easy to clean and comes with a lifetime warranty (even if it falls to the ground). Decorative Hummingbird Feeder: A perfect combination of form and function, these feeders will satisfy the needs of all of your hummingbirds while adding a decorative flair to your yard. They’re also backed with a lifetime guarantee.